I’ve come to love my iPhone 4. I feel it truly is a game-changer. I use it as my phone, GPS, remote control, instant messenger, web browser, schedule book, and alarm clock .But if I could change one thing about it, I would fix the limited alarm clock abilities. The most annoying thing in the world is to come out of the shower, or from anywhere after leaving my iPhone alone in a room while the alarm was going off, to find the alarm STILL buzzing away, 30 or 45 minutes later, with my battery just about dead. Apple, please just add a simple configuration in the alarm edit screen to allow how LONG we would like the alarm to sound to be set. And, yes, I know there are alarm-clock apps out there, even free ones, that will accomplish this. But this seems like a simple enough request for Apple. And I’m sure everyone else in my house would appreciate not listening to my iPhone buzz away for hours on end. 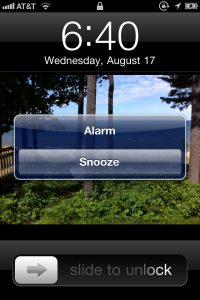 This entry was posted in Apple, iPhone and tagged alarm clock, Iphone 4, iPhone alarm on August 17, 2011 by David.